For this installment of the Poetry Room, we're going to shift to the local. 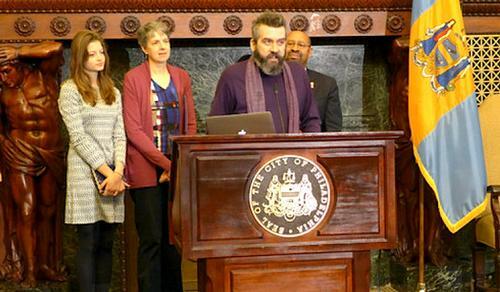 Philadelphia is looking for its next Poet Laureate! Supported via the Mayor's Office of Arts, Culture, and the Creative Economy, the search is on now to fill the role of Poet Laureate for the third time since the inception of the position in 2012. The new Laureate will serve a two-year term, earn a stipend, and be asked to develop and implement a project that spreads the love of poetry in the city and wider community. Additionally, the Laureate will act as mentor to the Youth Poet Laureate who is chosen from among Philadelphia's high school students each year. Our city's first Poet Laureate, chosen due to her wide-reaching influence in Philadelphia and beyond, was Professor Sonia Sanchez who served from 2012-2013. Known as a writer (of more than 15 books! ), cultural leader, and peace and racial justice advocate, Professor Sanchez has been honored by many and read by thousands. Add your name to the list by reading some work from her most recent book, Morning Haiku, here. Our current Laureate, serving since January 2014, is Frank Sherlock. To learn about Sherlock, you can listen to an interview, recorded soon after his appointment, with Radio Times host Marty Moss-Coane here on WHYY’s site. In it he reads a portion of his well-known, Philly-based poem, “You Can Feel Good About.” Sherlock's Poet Laureate project, Write Your Block, engages students of all ages and adults of all stripes in making poems that embody the (very specific) places where they live and work, essentially creating a map of poetry of Philadelphia. Check out some of the work that has been made as a result of this project here. But back to the current search: Are you passionate about building a stronger culture and community of poetry among Philadelphians? Do you have the poems and ideas to prove it? Apply to be our next Poet Laureate today. The deadline is midnight on Tuesday, October 6. Here's the application. And hey, if you're just a casual reader of this blog who isn't a writer or isn't ready for the big stage, keep an eye out for what the next Poet Laureate has up his/her sleeve. We'll need your participation for the projects to thrive. As always, if you have an idea for a poetry topic that you'd like to see discussed as part of this blog, leave a comment below. More soon! Add a Comment to The Search for Philadelphia's Next Poet Laureate Is On!